This book is exactly what it says it is--the personal journal or history of Joseph Smith Junior. 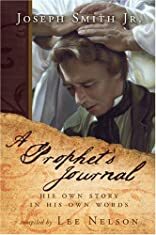 It does not contain the usual interpretation and opinions of scholars, theologians, and historians, but Joseph's own account of his revelations, persecutions, disappointments, accomplishments, and day-to-day happenings. For the first time in the history of the Church, this text assembles together into one handy volume the great majority of Joseph's first-person journal entries which are scattered throughout the seven-volume History of the Church among letter, revelations, notes, and numerous other documents. There has been no attempt to edit or condense any of Joseph's writings, although for the sake of brevity some entries of little historical significance have been omitted. Nothing of doctrinal or controversial nature has been left out. About Cedar Fort (Editor) : Cedar Fort is a published editor of young adult books. A published credit of Cedar Fort is The Adventures of Hashbrown Winters. About Inc. (Editor) : Inc. is a published editor of children's books. Published credits of Inc. include Isaiah's Big Surprose.